The latest from the capital is that Tim Hightower is the likely nominee to start in the Washington Redskins backfield come Week 1. The newcomer has benefited greatly from his D.C. surrounds, a strong supporting cast, and most importantly, an offensive policy that plays to his strengths. The men protecting the fourth-year back out of Richmond have sealed blocks supremely thus far, allowing their nimble running mate to break off a couple of scorching runs during these "primaries". Coach Shanahan's linemen are certainly a quick and bold congress, shifting as they need, and able to hold defenders on the weak side. Their resolve encourages Hightower's sharp cutbacks. As a result, Washington leads the NFL in running this preseason with 152.3 yards per game, and Hightower contributes 6.8 yards per carry to that total. This is a player whose career 3.9 yard average had made him disposable in John McCain's home state. That's what a fresh campaign manager like Shanahan can deliver for you. Hightower's 37-yard bolt against the Ravens last week was not only encouraging for Redskins fans - who have surely forgotten that yes, they can win - but was a burst of power that stunned the usually vaunted Baltimore defense. Starting deep in the backfield, No.39 took the ball from John Beck while charging sharply to the right. The blockers stepped and parried in the same direction with the type of cohesion you'd applaud the Redskins cheerleaders for, let alone a bunch of 300-pounders.And as the Ravens backpedalled, arms pinned and feet splayed, Hightower jigged and sliced left. There was nothing that could be done once he entered daylight. He chugged across and around a stretched defensive backfield all the way to the far corner. The night ended with Hightower tallying 59 yards on just nine carries. 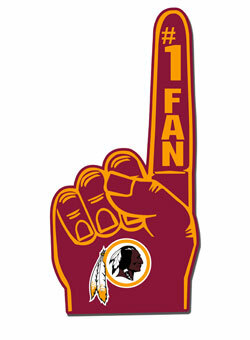 Yes, Skins faithful, have a spring in your step - your feature back finally does! And if he can continue to rip through tougher defenses with the same tenacity, and his line keeps opening holes wider than the 14th Street Bridge, there's little question Hightower could morph into a top 10 fantasy back. Okay, there is still a possible deficit in the D.C. quarterback situation, which historically causes heartache amongst supporters and fantasy owners alike. But Beck and Rex Grossman have shown promise and are not afraid to send the ball rocketing down field. So at the very least, defenses will have to honor the pass, even if they're not quaking in their cleats. Sometimes doubt can inhibit men as much as fear and that's all Hightower needs to make the most of his 10-15 carries, and earn his place as Washington's new standard. The Los Angeles Rams have never felt as distant as other defunct NFL outfits, mainly because they still exist - well, sort of. Since the team's migration to St. Louis in 1995 we've seen the Ram logo streamlined, club colors intensified and oh yeh, a Super Bowl Championship. It's tough to argue change when it brings that type of success, right? Forgotten Batman Michael Keaton knows how that goes. But L.A. Rams fans lost interest a long time ago. They don't care about Great Turf Football Shows (or whatever it was), future Hall of Fame Quarterbacks like Kurt Warner (no offense, he seems like a swell guy), or championships of any kind outside of Orange County. The truth is, real Rams fans passionately supported their squad for almost 50 years, during which time the superbly bright yellow and blue hard men of Anaheim - Youngblood, Slater, Dickerson, Faulk etc - put on a show of their own, some of the most entertaining football ever played in fact. 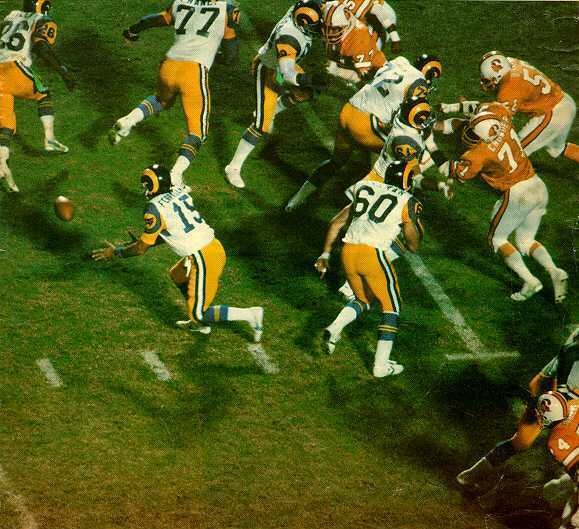 The Rams were so thrilling that they were the first pro football team to have all of their games televised in 1950. Consider how big a deal that was so early in the TV era. Don Draper would have wooed 'til dawn for a piece of that action. So as rumors swell about the possibility of an NFL team coming back L.A., you can't help but feel a little giddy that maybe, just maybe, the Rams have a chance of being that team (and of course, that your crusty Rams tee from '81 might also get another run in public). What's made the possibility seem more of a reality of late is that the L.A. City Council passed a memorandum of understanding this month that outlines a plan between the Anschutz Entertainment Group and the city to build Farmers Field. Thickening the plot like an L.A. fog is the news that current Rams owner, Stan Kroenke, is good buddies with Phillip Anshutz. Maybe they craft this thing together, maybe they don't. What we do know is that it was a crying shame when the Rams were transplanted from their home by former owner, Georgia Frontiere, who apparently tanked the L.A. product to justify packing and shipping it to her home town. Rachel Phelps in Major League, anyone? Look, everyone recognizes how great St. Louis fans are and they don't deserve to lose another team after already giving up the, er, Gunners (briefly in 1934), and obviously the Cardinals to Phoenix in 1988. But the NFL is a business - as the talking heads say ad nauseam - and bringing back the Rams is not only right for the NFL historically, culturally and Karmically, it's $700 million worth of good business. And come on, who doesn't want to see those vintage Rams uniforms storming the pitch again? The idea of California football always appealed to me. Its dusty 50-yard line and sun baked bleachers were the antithesis of traditionalist football - winter winds, heavy snow, frozen tundras. The latter was harsh and messy, evoking icy crunches and cracks. They were bruising affairs that mired Midwestern and Mid-Atlantic teams in muddy trench warfare. The Californian game, by contrast, was brighter, more dazzling. Its football soared and its players blazed. Touchdowns were plentiful. The type of blue horizon backdrops and sweet lemonade-infused days I'm referring to are San Francisco 49ers games of the Eighties. Football was never more romanticized than those glorious years, during which Joe Montana surveyed the field behind center, dropped back to pass and fired the ball into the hands of John Taylor or Jerry Rice skipping across Candlestick. Forty-Niners football always seemed to be cool and calm, free-flowing and determined. Sure, in reality, it might have been a little chilly by the bay, and there were probably more imperfections than I can recall, but on television it always looked sunny, and the red and gold uniforms appeared, well, gladiatorial. So it was certainly deflating to see the 49ers collide with their closest rivals the Oakland Raiders last weekend, in a contest that was a mere shadow of former glories. After all, the "Battle of the Bay", while usually confined to the preseason, is a competition and tradition clubs in remote corners of the map must salivate over. Here you have the golden glitz of the Niners, the team that took the West Coast offense to new heights, against the NFL's footballing pirates, a brand that embodies more than toughness - perhaps brutality. You couldn't script a better story if you were Steve Sabol of NFL Films. Unfortunately for fans of both teams, Sunday's battlefront was more stunning in the stands than on the field, and in this instance, that's a tragedy. Alex Smith looked better in the pocket and in delivery, but that's not saying much when you're coming from a state of disarray. Smith just doesn't apply enough zip on the ball, though he is releasing it more quickly these days. His feet look hurried, which my be why his passes are popping out like a pinched grape. One throw to Braylon Edwards - who made a spectacular single handed grab - gave hope. Then a floater to the Raider defensive end Matt Shaughnessy defused any excitement possibly brewing in the stands. Meanwhile, Oakland's Jason Campbell continued his penchant for clutching the ball too long. On one occasion it hindered his ability to find the open man in the back of the end zone, and on another, his final play of the day, Campbell took a stray knee to the helmet and was forced to leave. It's probably better that he had extra time to think over this performance. If not for Daniel Kilgore's fine block in the middle of the park that stalled three Raider defenders and sprung Kendall Hunter for a 53-yard touchdown sprint, this day might have felt like a great waste. And if the 17-3 scoreline wasn't crushing enough, it's now apparent that the weekend's fan violence has prompted police to seek a permanent ban on this famed match-up. 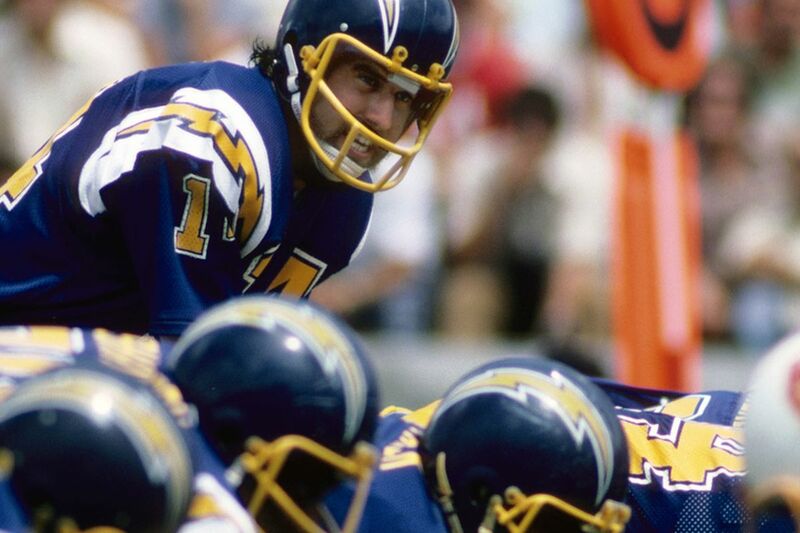 So now we're left to reminisce decades past, when those shiny gold helmets furiously knocked about sunny California with the scary silver ones. And it was really fun to watch. In a single jam-packed offseason in which trades and free agent signings were triggered faster than a nervy prom night consummation, Chad Henne is suddenly a bust and Kyle Orton is John Elway. This proves once and for all that NFL lockouts are good for nobody. Henne is the current Miami Dolphins starting quarterback, but not without having to endure criticism from fans and media, which has included boos, "sickening chants" and doubts about his leadership. Sure, Miami's No.7 hasn't performed up to expectations, has thrown some loose passes in training camp and has been possibly too honest with reporters. These things create doubt whether you're an NFL quarterback or the president. But that doesn't mean it's warranted. Henne, like any young QB, needs time to ripen. If fans in other parts of the country are willing to offer average performers like Mark Sanchez and Kevin Kolb an opportunity after all, then surely Fins fans can see the silver lining in Project Henne. Making the leap, as they say, is a process not an instance. To this end, there are three reasons why I think the Miami faithful should chant for Chad Henne, not Kyle Orton. Firstly, perception is overrated. There are some members of the media who love quarterback controversies, and in fact, spend most of their time drumming them up. You may recall the Sun-Sentinel's Dave Hyde announcing the "end to the Henne era" last year following his 16 for 32, three interception performance against the Browns. Clearly that assessment was incorrect, but it was the sort of stirring headline that has contributed to the perception among fans that Henne isn't fit for the job in Miami. That's the problem with being a highly drafted backup QB in the NFL, isn't it? Everybody loves your shiny new packaging. Once you throw a costly pick, however, you're damaged goods. Even if your only interceptions are during midweek scrimmages when simply testing the arm, chances are there's a reporter or blogger in the stands whose agenda is to rewrite the perception around you. It's the same powerful mechanism that allows so-called experts to elevate a player like Kyle Orton, a second-string game manager who currently looks like a swan amongst ducks. When Henne was a rookie backup, everyone was enamored with his potential. Playing understudy to Chad Pennington—who by comparison has a pistol to Henne's bazooka—only served to enhance the Michigan man's reputation. So by the time he earned the starting spot, everyone expected Dan Marino Version 2. (I guess the Microsoft era has burdened us with the notion of always "updgrading.") While Henne has a similarly powerful arm, he hasn't yet shown Marino-like vision. But shouldn't we give him a little more time to do so? Acquiring Marino or even Pennington-like vision will take time. Secondly, Henne can make plays. His top-line stats from last season paint an ugly picture: 12 touchdowns and 15 interceptions. We get it. But there have been moments among the poor passes that defy the numbers, moments where the quarterback squeezed a mini-rocket into the hands of tight end Anthony Fasano, or lobbed a rainbow over the shoulder of back Patrick Cobbs. You can't teach these passes, they're instinctive. There have also been plays that were superbly extended when Henne, despite lumbering size, moved out of the pocket with agility and poise. He's rolled to the right and side-armed lasers; other times he's hopped forward behind the defense to steal first downs. That's solid quarterbacking. Before we jump to the next online forum to chastise Henne, think about Marino's first few years as a pro. In only his second year, No.13 threw 17 picks. In his next season, in 1985, he gave away 21 interceptions. Now Marino certainly threw a lot more touchdowns, but he also had some elite receivers like Mark Clayton and Mark Duper, not to mention the fastest release of any QB in memory. Henne isn't far off. He just needs more time and patience from the very pundits who called for his number when he was riding the pine. Finally, Henne has more upside than Orton. I'll admit, the prospect of adding a quarterback who could instantly convert seemed attractive.Yes, Kyle Orton, for a moment, felt like a good idea. But then I stopped throwing back the Kool-Aid and asked myself, "Are we talking about the same Kyle Orton who barely held down the starting gig in Chicago? Are we talking about the same Kyle Orton who in 2005 threw just nine touchdowns, 13 interceptions and fumbled six times? Are we talking about the same Kyle Orton who completed just 58 percent of his passes against Henne's 61 percent in 2010?" Over the past few weeks, we've all been led to believe that Kyle Orton is closer to John Elway than Gary Kubiak. But the reality is that Orton won just three games last year. Henne won seven and his ceiling isn't yet in view. Orton's ceiling looks more like the one Charlie and Grandpa Joe flew up to inside the chocolate factory: it's suddenly there, slippery and somewhat dangerous, with seemingly nowhere to go but back down. After a break during the NFL lockout, Why Football Is Cool is back. We're starting fresh with both a new design and editorial slant. Hope you enjoy it.